This post is the fifth installment of a blog series chronicling Mr. Rickbeil's educational trip (and much needed vacation) to Finland this past summer. Last Fall, I was in the midst of a brutal six-credit semester at Marymount University when I came across a book titled The Smartest Kids in the World. I had already chosen to research the topic of anxiety disorders in one of my classes, but I was curious about this book, particularly because I had heard good things about education in Finland. The book immediately drew me in, and within days I had changed my research topic to the Finnish education system. Over the rest of the semester, I worked longer and harder than I ever had at any point in my career, leaving Trinity regularly at 6:00 and spending many evenings in the Baltimore County Public Library working on my Finland research. However, I found the topic to be so interesting and meaningful that the long hours and late nights passed quickly. Once again, I was encountering flow. If you have not heard the word flow used in this context, it is best defined as being completely engrossed in what you are doing. When you are in a state of flow, you are firing on all cylinders, working hard on a task while enjoying it the entire time. You are motivated yet challenged, and you find the experience too hard to walk away from because you enjoy it so much. When you are working in a state of flow, hours go by as if they were minutes, and the tedious details of the job become interesting parts of a puzzle. It is, without doubt, the best way to work. In my research of Finnish education, I did not reach much about flow. In my tour of Finnish schools, the educational experts and principals that I spoke with rarely talked about flow or its importance in Finnish classrooms. They didn't need to. I saw it firsthand everywhere I went. The second grade students that walked over to the public library immediately after school were experiencing flow. The middle school students making pancakes in their home economics class knew about flow. The teenage high school graduate leading me on a tour of her former elementary school demonstrated flow in all of her work. The teachers working in Finland's schools enjoyed flow as a regular part of their jobs. It was everywhere. Flow naturally answered many of my questions about Finnish education. Why do Finnish schools take 15-minute recess breaks every hour? The kids have a better chance to experience flow after taking these breaks. Why do teachers spend significantly fewer hours teaching in Finland and more time collaborating with their peers? Collaborating makes the job more enjoyable, with more flow. Why does Finland prioritize the "specials" classes? They create flow, and the variety of classes within the day make students more likely to find flow within their math and language classes as well. I remember one of the most powerful experiences of flow that I experienced in my life. During my junior year of high school, I had my career dreams set on being a meteorologist on the nightly news. For my high school service project, I worked as an assistant coach of a 5th and 6th grade girls' basketball team at Saint Elizabeth Ann Seton school in my hometown of Saint Cloud, Minnesota. Within a few weeks, I was hooked. 90 minute practices flew by, and felt as if they were 10 minutes long. Weekly basketball games became the most enjoyable part of my week. I started doodling game plans and diagraming plays in my notebook during chemistry class. The experience of flow I encountered coaching basketball changed my life for the better and led me to a career of teaching and coaching. The beauty of flow is that it shows us how God has made each of us so unique that we enjoy different tasks that would bore others. During my time in Finland, I befriended a German accountant who was well-versed in international tax laws. At one point, he gave me a detailed lecture on setting up a business within international tax laws while we biked together on the western islands of Finland. I never, EVER, would consider this work interesting, but I admired his expertise and the fact that he was so enthusiastic about his work. After all, even international taxes can be an experience of flow- just not for me. I worry that in the United States we are constantly drawn to an idea of education in which our children are well-rounded experts at everything. We yearn for our children to reach the American dream of being on the honor roll while earning playing time on the varsity team and playing at an expert level on a musical instrument at the same time. While learning to be a well-rounded person is certainly important, I think we would do better by focusing on each subject, sport, and activity as an opportunity for flow. In high school, the service component of my Catholic school helped me discover a love for teaching, coaching, and working with young people that changed my life. All of our kids should be so lucky. To create a school in which children learn to love learning, we must arrange it so that our students regularly experience flow. My trip to Finland was my first visit to Europe. When I told people this, many of them looked puzzled as to why I would make my first European venture to its remote northern outpost. I was not puzzled- I love Finland, and it was the perfect place for me to explore first. 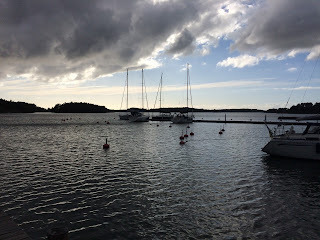 My trip there this past summer served as a 17-day experience of flow, whether I was visiting a history museum, relaxing in the sauna, biking on the islands of Finland’s Turku Archipelago, or visiting Finnish schools. I know I have a specific curiosity in Finland that is not shared by many other people, but I enjoy that as well. After all, you have to "go with the flow".